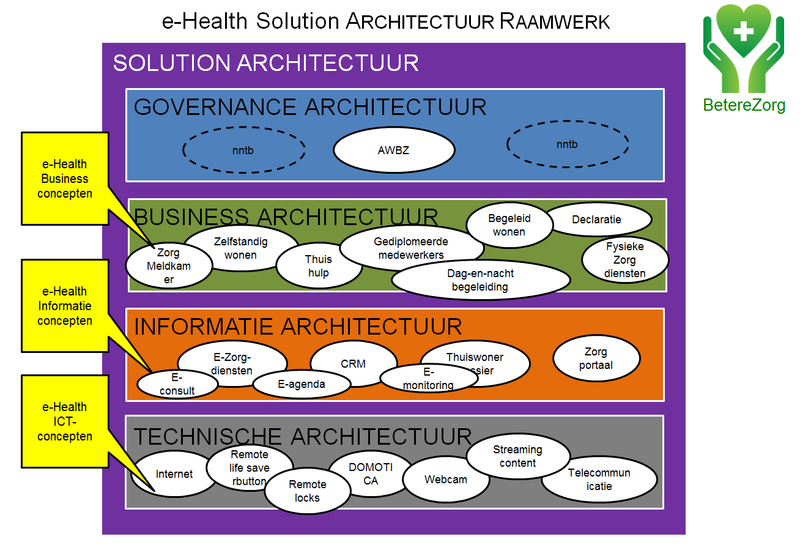 This is an example Solution Architecture Framework eHealth created on Dragon1. Dragon1 is a collaboration platform, on which you as Business Professional can learn, create, share and control interactive content. What is a Solution Architecture Framework? A solution architecture framework shows the architectures (groups of concepts and other parts like patterns, principles and building blocks) that together form a framework for a type of solution. In this case, the solution is eHealth as a total concept. The image is in Dutch and it was created for a Dutch hospital. Why was this Architecture Framework created? This framework was created to give the steering group of a strategic program a management instrument to direct and give focus to projects. We hope we have inspired you to start creating Solution Architecture Frameworks. You can just start by signing up for a Trial Account and create solution architecture frameworks by yourself in a specialized tool, such as Dragon1 as Enterprise Architecture Tool.